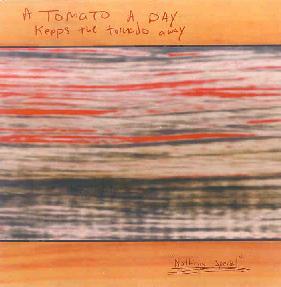 A Tomato A Day - "Nothing Special"
There isn't any info on the Public Eyesore site as to who makes up A Tomato For A Day. But that's ok. It doesn't get any more lo-fi than this. This 30+ minute set consists of Folk/Country/Garage/Pop-Psych/Rock songs that despite the crappy recording are nicely melodic and quite catchy. I'm a sucker for a raw homemade basement sound with all the associated warts which, if you listen closely, can never hide the passion and talent behind the blemishes. We hear everything from simple acoustic folk songs to full band electric guitar rockers. Dig that trippy garage wah on "You'd Rather Be depressed Than Alone". And then there's the thundering wall of sound heard on "Paranoid Musicians Worldwide", which is a bit out of character relative to the rest of the album. But I think my favorite is the wild and folk freaky "Cruising Through The Astral World". Nothing spectacular here folks... just a really nice set of songs.